A web report file contains both formatted text and graphics, so any web report you output from SPSS will look very much like the original data displayed in SPSS Statistics Viewer. Web report files handle graphics in a standard way, so you don’t have the typical graphic options to set. Note, however, that you do have some other options, as shown here. 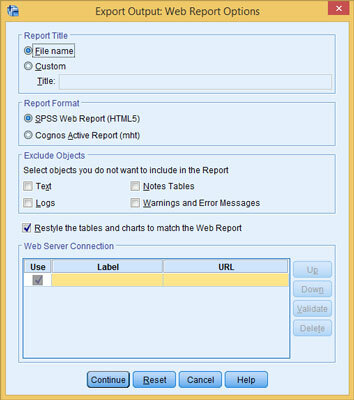 Web reports come in two formats: SPSS Web Report (HTML5) and Cognos Active Report (.mht). Options for producing a web report. A web report is an interactive document that is compatible with most web browsers, including popular ones such as Chrome, Firefox, Internet Explorer, and Safari. Web reports allow the flexibility to see reports online and, unlike PDFs, are interactive. 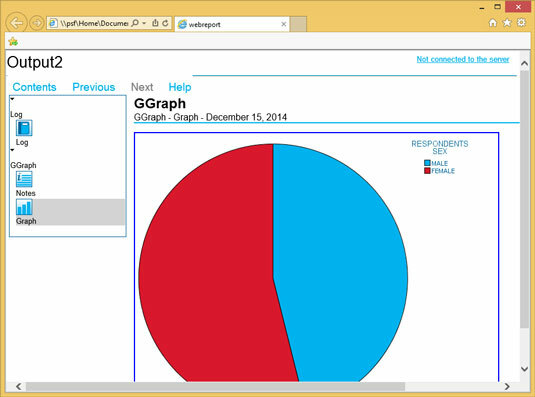 The following figure shows the interactive HTML5 Web Report file using Internet Explorer. The interactive menu bar on the left side allows you to click through the Log, Notes, and Graph portions of the web report. An interactive web report shown in a browser.